During SOL testing, I spent three weeks as “art on a cart.” I was aware going into it to it that it would be challenging, but also temporary, and I knew that I could make it work*. During my brief time on a cart, I learned some useful lessons. Keep the mediums to a minimum. I knew that the only way I could survive having limited access to my room and my supplies, meaning no restocking the cart during the day, was to limit the different mediums I used. Thankfully, I planned ahead and timed stitching and weaving to occur during SOL testing. My first three classes worked on stitching and weaving, and my las t two classes of the day worked on various different paper strip projects. 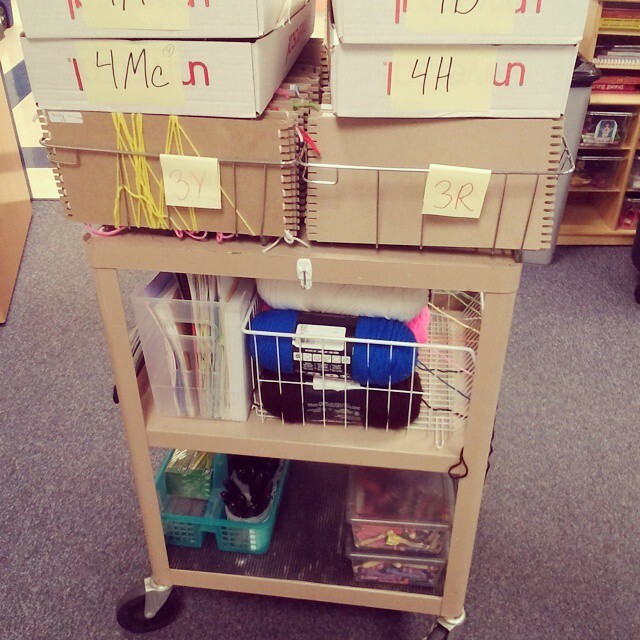 With careful planning and a well organized cart, I was able to have all of the supplies I needed for the entire day on one cart. This definitely wouldn’t have been possible had I been using multiple mediums throughout the day. Do not assume students will have basic supplies in their classrooms. I made a point of checking with classroom teachers to see what kind of basic supplies students had in their desks (pencils, crayons, scissors). Thankfully it worked out that students already had these supplies, so I didn’t have to worry about hauling them to the classroom myself, but I’m sure it’s not always the case in every classroom, especially at this time of year. Unfortunately, I neglected to think of myself, and was left scrambling for basic supplies while demonstrating the project to students. Evidently, not all teachers keep a small bin of Sharpies, pencils, a pair of scissors, a ruler, crayons and a glue stick on hand for demonstrations. Who knew? My house, my rules. I have done a lot of subbing in my time. When a sub is present, many students have the knee-jerk reaction of who are you to tell me what to do? Feathers can get ruffled, chaos can ensue. It’s expected when you’re a sub. You’re on their turf, there’s going to be a bit of a power struggle. I did not expect this to happen while on a cart, but it did. I naively thought I could seamlessly carry my art room rules into the students’ classroom. I was wrong. Like art teachers, classroom teachers work hard to build routines. They have their own rules (or lack thereof). Students learn, in this room, we do things this way. In one particular classroom, I found that the classroom teachers’ rules were a little more loosey goosey than mine. All of a sudden I have students getting up to get drinks or use the bathroom without permission, “but, Mrs. Carter** let’s us…” I found it difficult to establish authority in another teacher’s room, although I already had it in my classroom. It was especially difficult if the teacher remained in the room during art. It was an unexpected challenge. A change of scenery can do you good. The above scenario wasn’t the norm for my experience on a cart. I was fortunate to have access to the SACC room during testing. The unfamiliar location worked to my advantage. You know how at the start of the school year, the students are a little timid, unsure, and on their best behavior for the first few weeks? The same happened while we were in the SACC room. It was fabulous. The change of scenery was exactly what we needed to reset some of the bad behaviors/habits that had developed (theirs and mine) throughout the year in my art room. If you pile it high enough, it will fall. A stack of 12 x 18″ paper on top of a bin of Play-doh on top of three bins of paper strips and scissors on top of 30 paper weavings on top of two boxes of stitcherys on top of a dish rack of cardboard loom weavings*** on top of a rolling art cart equals disaster. Lesson learned. Art on a cart = sympathy. I’ve never received more sympathetic looks from other teachers than when I was wheeling my towering art cart through the halls. Okay, maybe when I was seven months pregnant in the sweltering 90 degree temperatures of June, waddling all the way across the school with a cart of clay animals to put in the kiln, but still, being temporarily demoted to art on a cart will garner looks of sympathy from others. Kids are flexible. I was afraid that I would be disadvantaged by my lack of supplies while on a cart. Especially when I thought of those two dreaded words every art teacher hates to hear, “I’m finished.” In my art room, students have a variety of supplies and activities available to them when they finish early. In my art room, they were used to having multiple options for adding color to their work, crayons, markers, colored pencils, oil pastels… While on a cart, early finishers had one choice, free draw with crayons. That’s it. I was fully prepared for a mutiny, but the uprising never happened. Turns out, when you tell students that this is what you can work on, and they see that there are no other options available, they’re totally okay with that. Really makes me wish I didn’t have open shelving in my art room as my only storage option. Art on a cart isn’t the end of the world. I survived art on a cart for three weeks. Would I want to do it for an entire year? Probably not, but it wouldn’t be the worst teaching scenario I’ve been in over the years (that honor goes to the two years I was in a windowless, ventless, octagonal room with less usable square footage than the living room in my townhouse). I could certainly make art on a cart work. Don’t tell my principal I said that. * I use this phrase multiple times during the school day. My students don’t really get it. Proof that I watch too much Project Runway? ** Name has been changed. *** Just before my art on a cart experience, I discovered a few dish racks in our supply closet. I was pleased to discover that the cardboard looms I use slide (almost) perfectly into the drying racks. It makes storing the weavings much easier and neater. I place a small label on the lefthand corner of the looms where the students write their names. Then we “file” them on the racks, and they can easily pick their work out. You can see the racks in the picture above. I’ve done the art on the cart thing and used it as a filler when testing was happeining. Like you, I went with dry supplies. I found that oragami was a great testing period project. All I had to cart around was oragami paper! The kids could make multiples until they had the project down. They could try a more advanced project if they finished early. All good stuff. It was a take home project so storage was a non-issue. The following week it was a more advanced project or retrying one that they couldn’t do the previous week. As to art on the cart on the long term: I was not a happy camper. My BOE thought I had magic powers and could appear at the door of the second floor on the north side of the building at the same time I was exiting a room on the first floor on the south side. It followed that classroom teachers were generally annoyed with me, because I was late for their prep time. A new cart was not order for the art teacher so I was given one of the old wobbly TV tower carts. I was truly a sight to see as I wheeled down the hall trying to haul buckets of water for painting and arrive in a timely fashion. Mind you I did try to tighten the bolts on the cart and decorate it. I can’t say I made it work, but I did march on. I think it finally became apparent that situation was undoable when the dean watched me try to load this cart on to the elevator. Suddendly there was a room. Some times the only way to get things changed is to let them not work. This is a lesson I’ve learn the hard way, so I share. Love, love, love the dish rack as a loom holder. Since I cut the looms from boxes I will cut them to fit the rack next year. Thanks for helping keep me sane this year with your wit and insights, hope your year wraps up well and have a great summer. I did art on a cart pregnant, and it was NOT fun. My years teaching from a cart taught me to appreciate what I have now, even if I don’t have a sink! I started my own blog while teaching from a cart, but the name stuck! I did art on a cart for two of my five days this year (in a brand new million dollar school for which they build no art room $%#!!). I’d rather work at Costco. Nuff said.